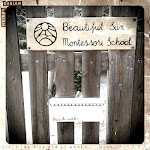 Beautiful Sun Montessori: Year #4, I can't believe it. Year #4, I can't believe it. Because we finished our third year of school, our first complete cycle, I decided this vacation to invest a good chunk of money and time into our building. To give it a breath of fresh life for the next 3 years. We spent some weeks this summer repainting the entire inside of the school, had the outside of the school painted, and renovated our porch by closing it in and making it part of our classroom. The changes have really made it feel like a new place. I was nervous that closing off the porch was a big mistake and would rouine the flow of the classroom, but instead has given us a fourth more of beautiful classroom space to work with. Plus, it has made our lunch room 100% independent of our classroom. It's amazing what a coat of fresh paint will do to a room. We repainted our kitchen a much lighter shade of green and it has made it feel much more spacious and cooler. I'm in love with our kitchen. Because of our structural changes, we moved the snack table to the middle of the classroom. In it's more central location, it gets noticed so often and all the practical life hovers around it. It's awesome. Children sweep spontaneously, wash the table, mop around it and generally keep it much neater than when it was in a far corner of our room. What a gorgeous classroom! You have done an amazing job to make it a beautiful, inviting space. Your school looks absolutely wonderful! Wishing you a wonderful new cycle, full of laughter and learning. I love it. Congratulations on completing a full cycle! Thanks for sharing about the improvements you made this summer to the environment, and for telling us about your planned activities for promoting community!